Canada, eh? I’ll be the first to admit I know too little about the whisky of our neighbor to the north, but it’s clear that Canadian whisky is riding the same surge of love that is hitting bourbon and American rye these days. We’re seeing more premium releases, and they’re exporting more and more around the world. 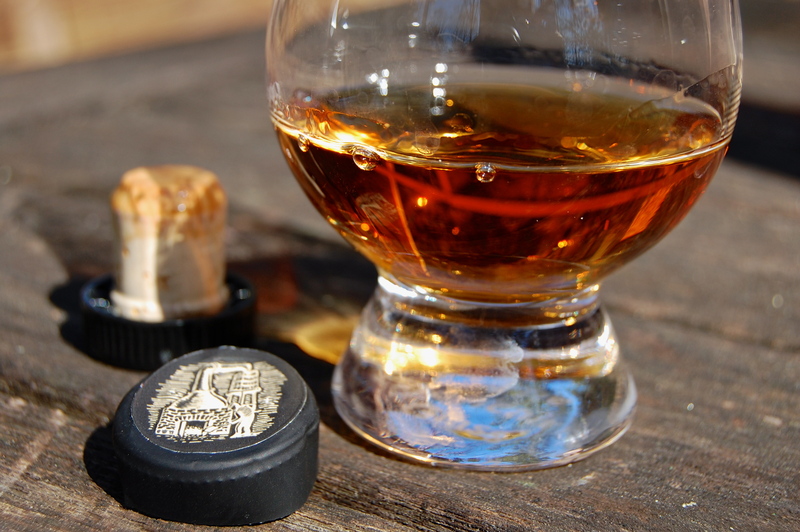 I’ve tasted a few, including American-labeled bottles of Canadian whisky like WhistlePig (what? WhistlePig isn’t made in Vermont!? but it says “hand bottled at WhistlePig Farm, Vermont”!). There’s plenty of nice stuff coming out of Canada for sure, but nothing I tasted really got me excited to fully embrace Canadian whisky… until I tried the Lot 40 Rye Whisky 2012 Release. There are a bunch of much wiser Canadian whisky drinkers out there who have extolled Lot 40’s virtues. It won this big award from Whisky Advocate. And this one, too, from a bunch of Canadian whisky pros. 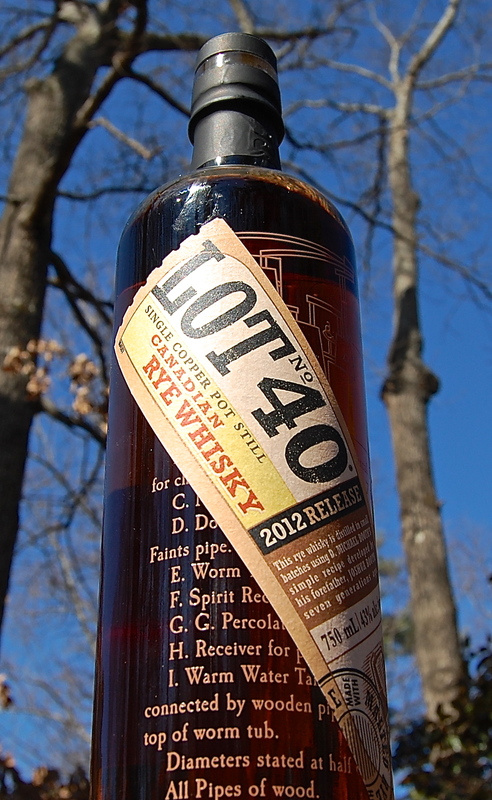 And you can read a scholarly history of Lot 40 here (please do, really) from Davin de Kergommeaux, “certified Malt Maniac.” Most importantly, try to locate a bottle of this stuff ASAP. 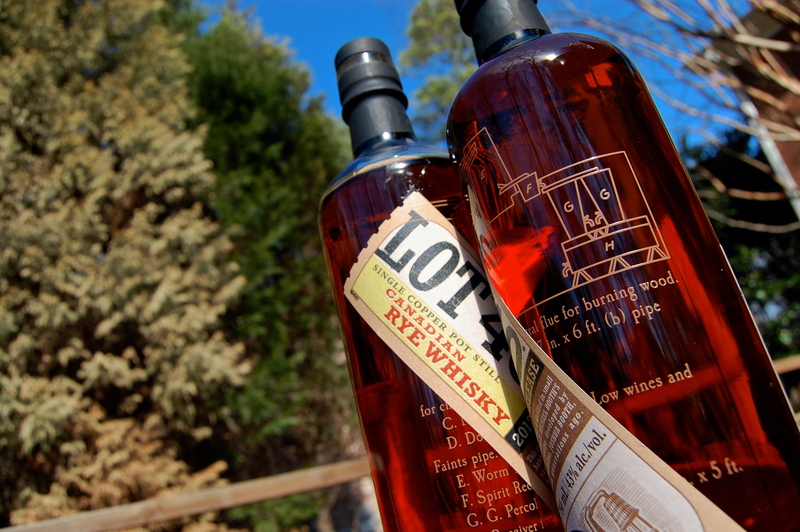 Lot 40 has been rolling out in select markets in the US over the past few months (after hitting Canada in late 2012), and just hit Georgia in January. It’s a limited release, so bottles are not likely to stick around for long. No telling what the next go round will look like, assuming there is one. So get it while the gettin’s good. A few quick details, then the review and tasting notes. 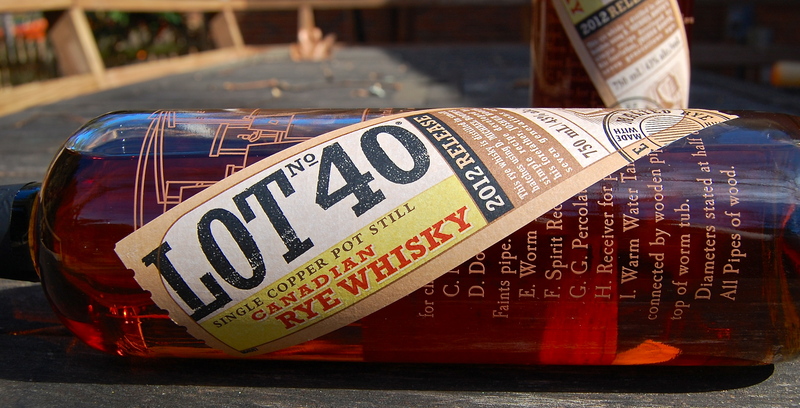 Lot 40 is a marriage of many batches of copper pot still rye whiskey – 90% rye, 10% malted rye – spanning different ages. I’ve read it’s mostly in the 7 to 8 year old range, aged in a variety of barrel types. It was produced at the Hiram Walker Distillery. Lovely rich copper color on this Canadian. Sniff it and you get prominent rye bread, then a fruity almost bubblegummy note, nutty black walnut, ginger and a lot of intriguing spice notes. Think ginger peach cobbler with walnuts and a sprig of mint on top. It also had me thinking of Italian amari (that’s the plural of amaro, at least I think it is, kinda like octopi is to octopus, but I digress…) with their bittersweet baking spice character. This is made for sipping – no water, no ice required. In fact, I much prefer it neat. This will not be confused for bourbon, it’s rye through and through, with a firm and elegant strength. It’s supremely well balanced, but you get bitter and slightly sour and delicately floral and rich warm grain and fruity tart at different moments in time. Baking spice shows up strong in the middle – plenty of clove, a burst of sharp ginger. A bit of wood shows up, but never gets in the way. The finish starts off sharp with those rye and spice notes, then mellows and fades slowly into happiness. It’s highly complex and highly drinkable, wholly rye but very distinctive at the same time. This is an incredibly singular whisky. 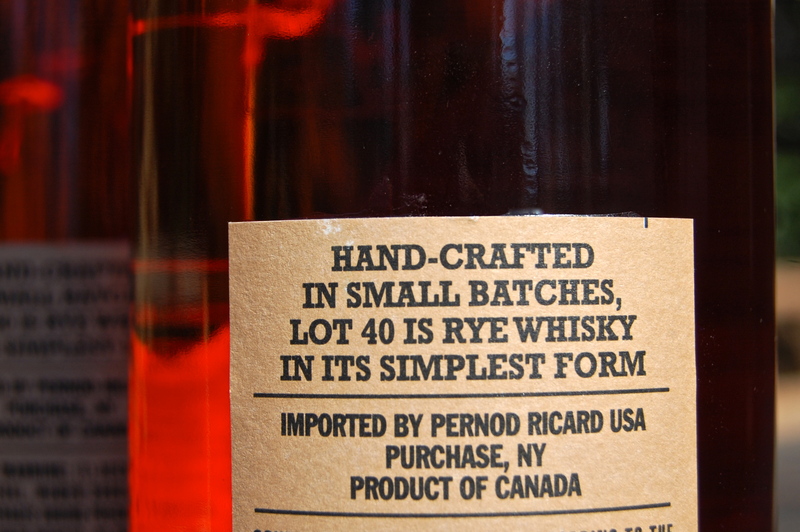 For American rye drinkers, it will have you questioning what a great rye should really taste like. It may not have the power of Thomas Handy, nor the age of the Sazerac 18, nor the warm embrace of the Van Winkle Family Reserve, but – to me – it’s every bit as intriguing, enjoyable, and impressive as any of those great rye whiskeys. O Canada! Very nice review, it makes me want to pick up a bottle and i already have two. Found this in Toco Giant – REALLY looking forward to cracking it. Ted, I really hope you like it – this one can be a bit polarizing because it’s quite different than what most people associate with rye. Wow I agree. 90% rye and 10% malted rye, what more can you ask for. As a long time Sazerac Rye drinker and all around rye devotee, I thought I could not be surprised by any upstart from Canada. Too many so so rye blends from up north. WOW is right! How subtle and understated, yet full of flavor. Sorry Sazerac, you have slipped to #2. Best rye, i’ve personally, ever had.